Confidence intervals show us the precision of an estimate. 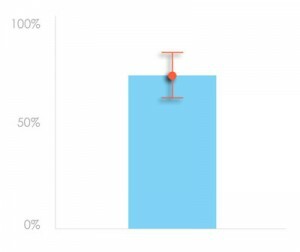 For example, if we asked 100 visitors to a website if they were successful in achieving their goal, and 70% told us they were successful, the confidence interval will show us the range above and below the 70% success rate that we can confidently estimate the actual success rate for all visitors. Confidence intervals are valuable in providing more accurate estimates to base decisions on. Popular methods for calculating confidence intervals for binary data (e.g., yes/no, pass/fail) are not accurate when there are few participants(<100). Furthermore, because usability research typically involves a low number of users (e.g., 6), the Adjusted Wald Method should be used for calculating confidence intervals for binary usability data, such as success rates. Use the calculator below to calculate the point estimate (i.e., the estimated average for the population) with 95% confidence intervals for binary data. Enjoy!